So, you have your company Twitter account or accounts and you are managing them competently with Cotweet or Hootsuite and your departments are tweeting about the right stuff. (See previous post). But how to make the best of your Twitter output? How to show off your accounts so they get followed by the right people inside and outside you business? This is the first part of our simple guide to Twitter syndication. It will show you how easy it is to embed feeds into your company's web pages. The second part will look specifically at putting them into your WebAdvantage® site. The simplest way of syndicating is to insert a link to a Twitter account which says "Follow us on Twitter" or "Follow our Chemical Division's tweets". There are any number of free Twitter icons you can incorporate in this link - have a look at the free giveaway icons at Smashing Magazine. A simple link like that might just suit your style. However it is much more eye-catching to give people a taste of what they would be getting if they followed you - live content which refreshes regularly always being a good draw. 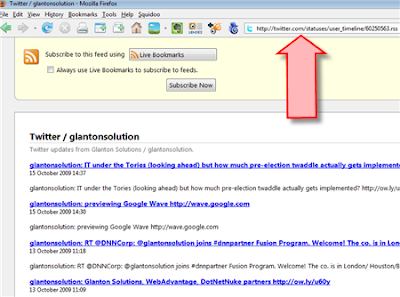 The first thing to do is to find and save the RSS feed for each of your Twitter accounts. Go to the profile page of of the account and look at the bottom of the right sidebar as illustrated below. 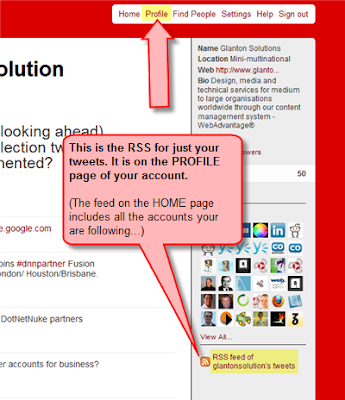 There you will see the link to the RSS feed for your tweets. Bookmark, or copy & paste the URL from the address bar to a safe place for future reference. 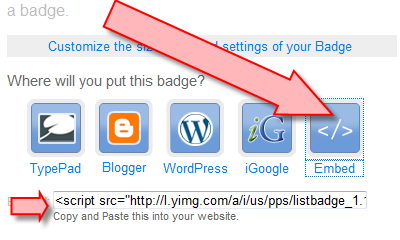 The next thing to do is put the feed in a badge or widget so it can be embedded in a webpage. These are kinds of miniature feed-reeders which can be easily incorporated in the HTML of a webpage. There are many different services which will generate widgets for free, and blogs have their own gadgets for putting RSS feeds in the sidebar. In Blogger, for example, click on 'Customise' > 'Add a Gadget'; then scroll down until you find 'Feed' > click '+' > 'Configure' > choose options > 'Save' and you get something like ours in your sidebar, which has conformed to the 'style' of the blog. Scroll down this blog until you see it in the right sidebar. However, that is Google doing it for you. 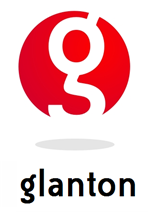 In an ordinary webpage you need to use one of the free services already mentioned to generate the code for you. My preference is for Yahoo Pipes, about which I have already blogged. It may seem a bit 'OTT' to use Pipes for a single feed, but I like their customisable badges, and besides, Pipes is very useful for doing more complicated things with your feed(s), as I will demonstrate below, so it is right and proper to do everything in the same style. Imagine you have four or five departmental Twitter accounts. You might like the idea of showing them off by putting them on your home page as a single feed, sorted into publication date order. Visitors to your site would see that different posts were generated by different accounts and when they clicked on an individual post they would be taken to the particular generating Twitter account. This can be done very easily with Yahoo Pipes. 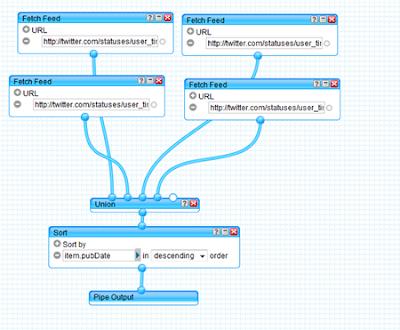 The top four modules gather the Twitter RSS feeds; then 'Union' does what it says and puts them into a single feed. If you have more than five feeds to merge you will need to use an extra 'Union'. In the unlikely event you have more than nine, you will have to use a third, and so on. The new single feed is then piped through a 'Sort' module - in this case set to present the posts in publication time/date order. If you would like to make your own version, save a clone of my Pipe, which I have made public, and then modify to suit your Twitter feeds. then 'Embed', and copy & paste the generated script into your page, where it will pick up the style of the page for body text and links etc. In Part Two I will look at putting Twitter feeds in a WebAdvantage® site.